Noted for ushering in the “retro” era, the decade of the 1990s was arguably the most transformative for ballparks in baseball history. 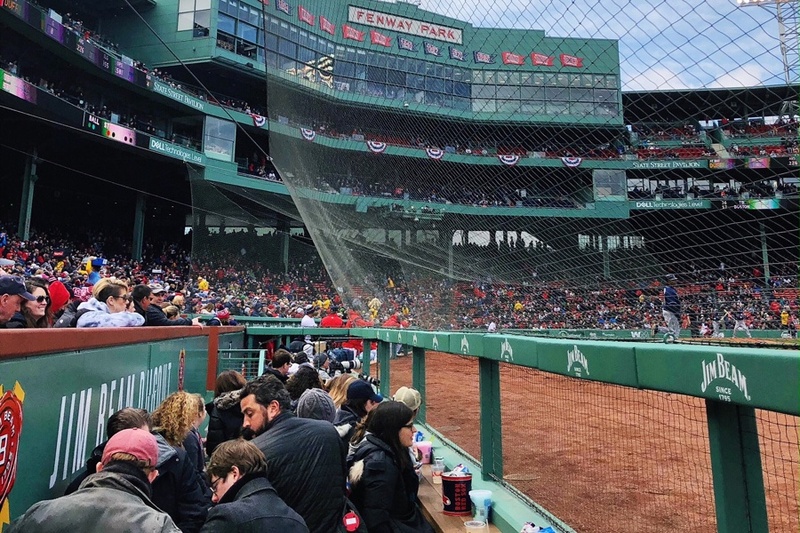 Eight Major League Baseball stadiums opened during this decade (nine if you count Tropicana Field), most distinguished for their integrated contextual aesthetics and fan-friendly features. Comparing a place like New Comiskey Park (1991) to Safeco Field (1999), the very nature of the ballpark was transformed into a playground for America’s taste in sports, architecture, business, and general consumerism. 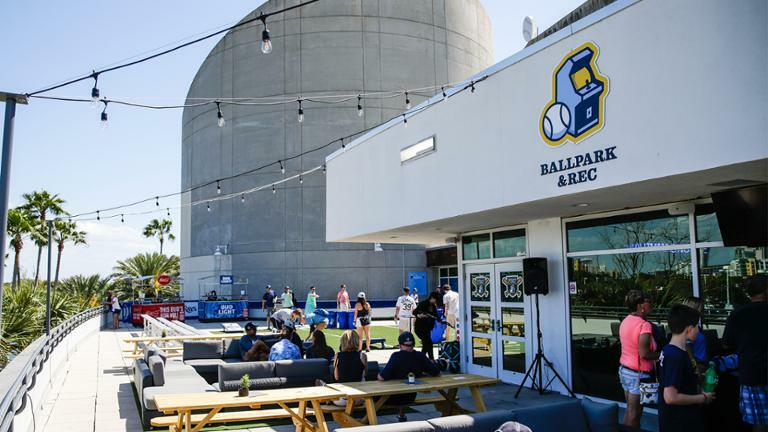 The 2000s further accelerated the retro trend, ushering in 12 new ballparks and continuing to up the ante for tasteful design flares and high-end amenities. By contrast, only three new MLB ballparks have opened in the 2010s. If you took the national ballpark tour in 2011, then took it again in 2018, you’d have a similar impression. Whereas the ‘90s and ‘00s were about “revolution,” the 2010s are about “evolution”. I predict we’ll see more “evolution” for a long time, as new parks such as SunTrust Park and Globe Life Field (2020) aren’t considerably different from their predecessors in design. The emphasis is on adding new revenue generating amenities, not altering the aesthetic ethos of the modern-day ballpark. “Social spaces” galore (link, link). Both high quality local food, and great food variety, are much more ubiquitous. The national craft beer trend hit the ballpark first, I would argue. Team cultivated mixed-use development around the ballpark. Perhaps receiving more attention than any other ballpark alteration this off-season, St. Louis’s downtown ballpark added a bonafide “social space” in the right field upper deck called the Budweiser Terrace. Constructed in the vein of Coors Field’s “Rooftop,” the 20,000 square-foot space features a concert stage, a large BBQ grill, two full-service bars, open cabana seating, lounge seating, and many standing room spaces. Compared to other major league ballparks, Busch Stadium was previously lacking such spaces. Image courtesy of St. Louis Cardinals. In a park formerly lacking in either traditional accessible sit-down restaurants/bars or fan-friendly social spaces, this is a most welcomed addition. Even when it opened in 2006, before this trend of social spaces or “millennial areas,” as Rob Manfred put it, Busch Stadium was behind the curve in this department. Whereas almost every park in the 2000s had numerous sit-down bars and restaurants open to all fans inside the park’s gates, Busch Stadium had none. When parks in Baltimore, Cleveland, Denver, Seattle, Houston, Detroit, San Francisco, and more added these “social spaces” in the 2010s, St. Louis had nothing. 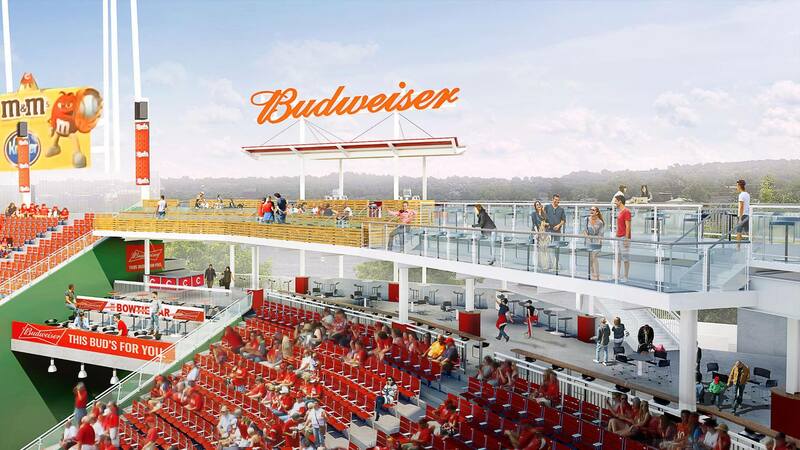 This was always Busch’s biggest flaw, so the Budweiser Terrace is a clear step in the right direction, and will result in some sort of boost in rating when I revamp the review and finally release a cumulative ranking this summer. We’ve (and I’ve) been to the Coliseum, but it’s a park I have rarely spoken about because I haven’t been there with the purpose of truly rating it, and for good reason. Unlike even the dreary Tropicana Field (Tampa Bay), the Coliseum has no pretenses of being a ballpark. This is ballparkratings.com, and that’s not a semantic copout. We have the Coliseum last by a fair margin, over 10 points worse than even Tropicana, which at least makes a decent showing in the amenities department. When was the last time a baseball-specific addition of this magnitude was make to the Oakland Coliseum? Image courtesy of Oakland Athletics. Having said that, Oakland made its first substantial baseball fan-friendly addition in recent memory this off-season. Another social space! Dubbed “The Treehouse”, the 10,000 square-foot area is similar to that described above in St. Louis, featuring patio areas, bars, lounges, drink rail seating, and standing room areas. Like all of these spaces, it is available to all ticket holders on a first-come, first-serve basis. The A’s also sell tickets just in this area. Behind Busch Stadium, Coors Field made perhaps the most significant changes this off-season. Along with Progressive Field in Cleveland, Coors has also made the most dramatic changes this decade, which will ultimately catapult it well into the top-10 of our rankings. With many teams addressing outdated videoboard technology during the 2010s, a replacement at Coors Field was long overdue. The Rockies installed a new 8,369 square-foot videoboard. Accounting for the other new videoboard in 2018 (see below, Angels), this is the 5th largest in baseball . This videoboard arms-race is ongoing, to the point where boards added at the beginning of the decade are no longer in the top half in size! 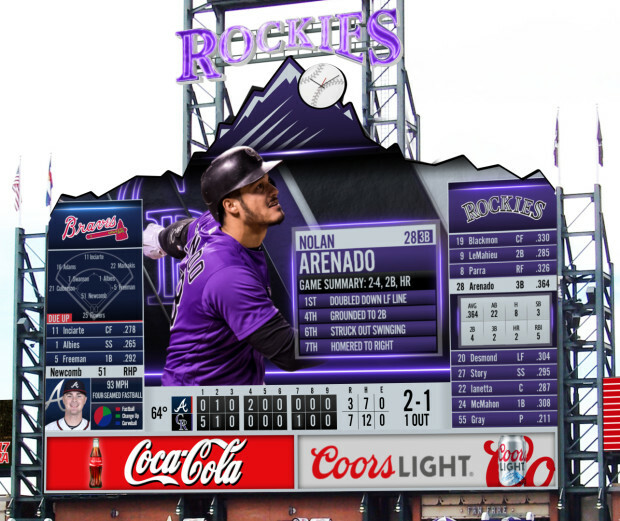 So, while its size may not be notable in a few years, the Rockies’ videoboard also stands out for its unique design, with a mountain logo at the top of the display. This is one of the few boards worth seeing not just because of sheer size. While the Rockies added the super-premium Coors Clubhouse behind home plate in the early 2000s, and the almost-as-premium Press Club in the early 2010s, the premium seating at Coors Field has always been pedestrian in selection and frankly a bit tired in quality. That changed through two major alterations in 2018. The Coors Clubhouse, added in vein of those ultra-premium all-inclusive home plate clubs that go for over $300 a game, was actually one of the most difficult tickets to obtain on the secondary market in all of baseball. This still holds true today. Assuming money is no object, many of these ultra-premium clubs can be had on Stubhub across Major League Baseball. But for whatever reason, tickets in this home plate club rarely enter the secondary market and are obviously sold out in the first place. That being said, the Coors Clubhouse was always rather cramped and the design was rustic and stale, a far cry from the luxury in New York, Washington D.C., Atlanta, or Miami. 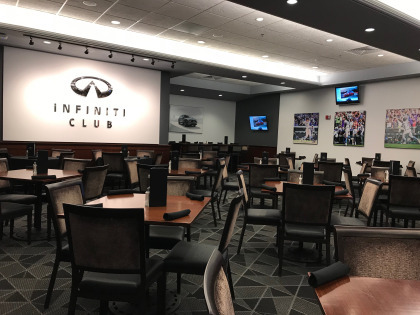 Formerly known as the Coors Clubhouse, the renovated Infiniti Club at Coors Field more closely aligns with a typical high-end club space, while the former set-up appeared as if it was an afterthought. Either through finesse or out of pocket, I’m usually able to see the best areas any MLB ballpark has to offer, but I’m having trouble getting my paws on Infiniti Club tickets. We’ll be at Coors Field in late June. Message us on Facebook if you have any leads! Image Courtesy of CBS Denver. 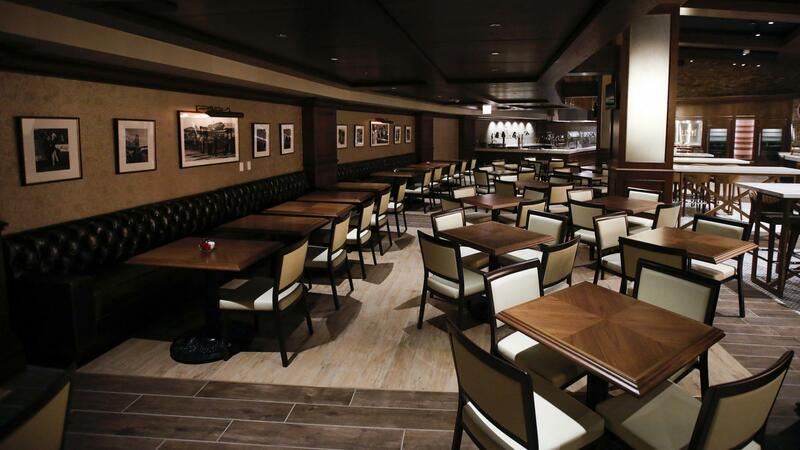 Rebranded as the Infiniti Club, that changed in 2018, as this space has been completely renovated and exudes an upscale but understated luxury seen in most other premium spaces in Major League Baseball. Second, and certainly more accessible, the third base side of the Wells Fargo Club Level has been completely overhauled, adding much needed additional lounge seating and a vibrant high-ceiling space. Coors Field’s club level always screamed 90’s waiting room décor, so we’re very glad to see renovations here. We will be visiting Coors Field for the first time since 2011 this summer, and while a boost in the ratings for “The Rooftop” has already been factored in, the park should benefit from an additional increase due to the new videoboard and club seating renovations. This walks the line between simple rebranding and a true overhaul, but it is worth mentioning because the purpose of the area is being transformed. 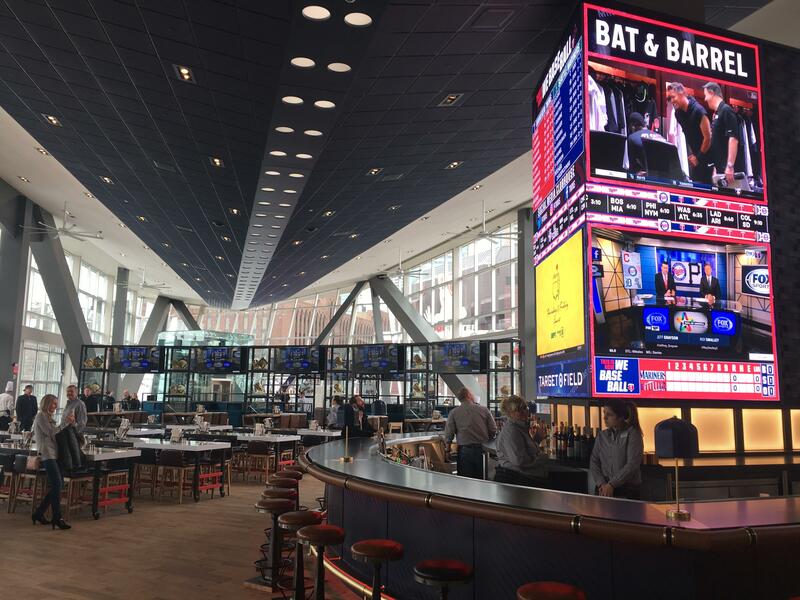 The former Metropolitan Club, a fine dining stadium club restaurant open only to season ticket holders, has reopened as the “Bat & Barrel”, a new social space open to all ticket holders. 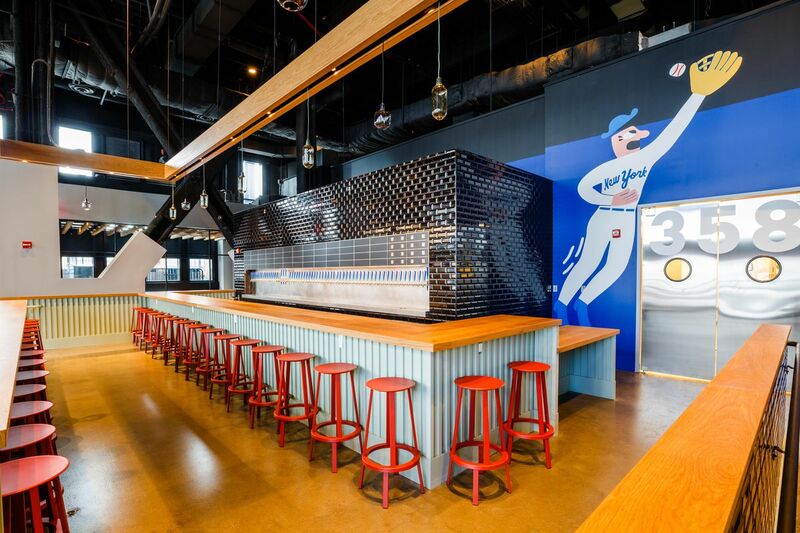 Great look at the hip new Bat and Barrel at Target Field, which replaces the more traditional Metropolitan Club restaurant. Target Field has been on the forefront of the development of social spaces in ballparks throughout the 2010s. There are very few true white table cloth “Stadium Club” restaurants remaining in baseball. Image courtesy of Minneapolis/St. Paul Business Journal. The new décor is quite sharp, highlighted by the new modern sports bar. Featuring everything from Adirondack chairs to large tables, the space appears to be quite versatile unlike a traditional restaurant, able to accommodate everyone from a large family to a group hanging out. The Angels are the second team to make a major improvement to their technology this off-season. A new right field videoboard, which measures at a whopping 9,500 square feet, will the third largest video display in baseball. This will result in an increase in rating. While Petco Park already features one of the largest videoboards in baseball above the left field bleachers, fans down the left field line have long complained of their inability to see it due to obstructions by the Western Metal Supply Co. building. The Padres finally responded by adding an ancillary video display above the right field bleachers. Citizens Bank Park has undergone some fairly substantial changes to some of the more peripheral areas of its amenities, namely its kids’ entertainment. The Phillies’ efforts in this department were always solid, but not spectacular, like, say, Kauffman Stadium’s wide array of kids’ areas like the carousel, whiffle ball field, and putt-putt golf course. Citizens Bank Park already provided a solid array of kids’ entertainment in the right field corner of Ashburn Alley, but the Phillies have introduced The Yard, a more comprehensive kids’ area. 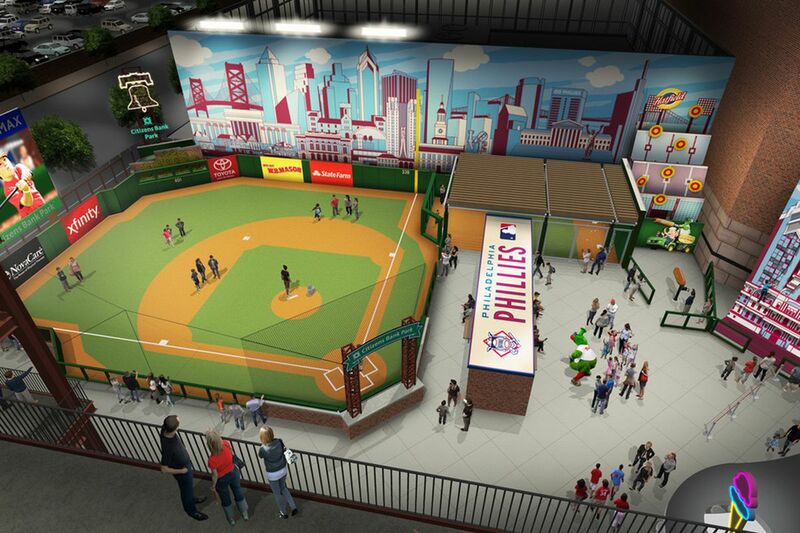 Most notable is the Phan Field, a kids’ whiffle ball field modeled after Citizens Bank Park. With a dugout, padded outfield walls, and even the Bank’s scoreboard, I’d say this is a step up from the usual MLB kids’ ballfields. The new entertainment zone also includes a speed pitch and a 30-foot climbing wall. I’ll take a closer look, but this should presumably lead to a small ratings boost. “The Yard” at Citizens Bank Park. Parks in San Diego, San Francisco, New York (Mets), Chicago (White Sox), Cincinnati, Cleveland, and Kansas City (more than I would have thought) have similar whiffle ball set-ups for kids, but this is the only one I’ve seen where the field mirrors the look of the actual ballpark. Cool! Image courtesy of the Philadelphia Phillies. 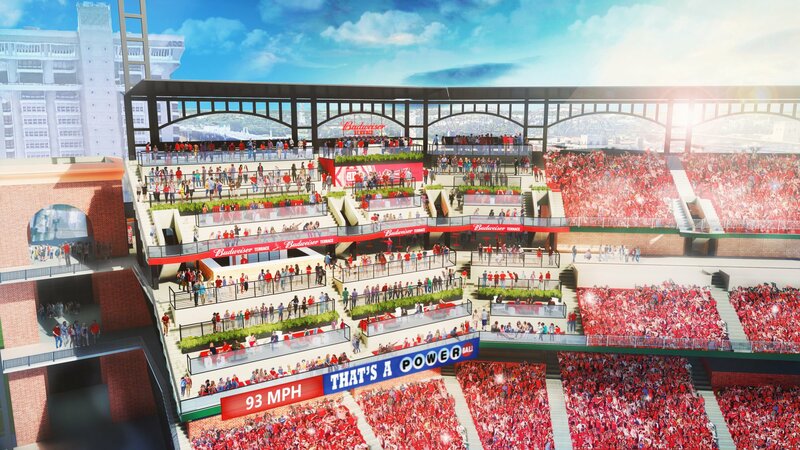 There were other minor alterations in Ashburn Alley, such as the relocations of the Phillies’ Wall of Fame and the addition of picnic tables and improved standing room areas. In my opinion, perhaps the most lamentable ballpark alteration of 2018 is the elimination of the cigar bar at Tropicana Field. However, the Rays added Ballpark & Rec in its place, which is better suited to appeal to more fans. Not only will the indoor/outdoor space feature fresh grub, but it will also offer specialty drinks, lounge seating, and a gaming area. So, despite my personal misgivings, there won’t be any changes in the assessment of the ballpark’s amenities. It should be noted a cigar bar is still interested in having a presence in a future Rays ballpark, which I would be ecstatic about. Ballpark & Rec at Tropicana Field in center field. I believe Tampa Bay has the rich and flavorful institutions to support a top-tier ballpark someday, but I just hope the fans come. Anyway, the cigar bar was stale in its former state, so this was probably a good addition. In fact, the outdoor component seen here was dormant when the cigar bar was in existence. Image courtesy of the Tampa Bay Rays. 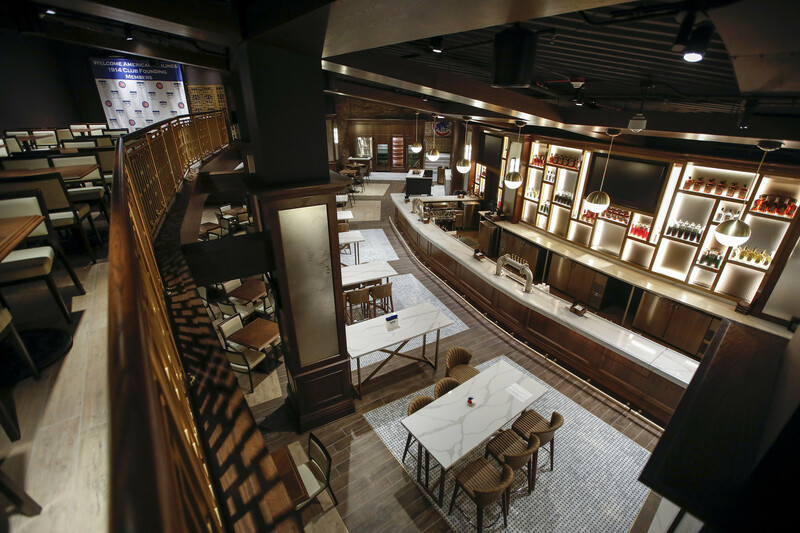 In the midst of a multi-year renovation, the most notable addition to The Friendly Confines is the American Airlines 1914 Club. Wrigley was the very last holdout in not having any true premium seating in Major League Baseball (although a few markets still lack ultra-premium seating). Going for $32,400 to $56,295 per seat per season, the 700 seat ultra-premium home plate club features a private entrance and all-inclusive food, beer, wine, and liquor. For a space of this sort, there’s been much written about it. I’ll reserve any analysis for when I see it, but good reads are primarily here, also here, here, here, and here. And that’s not it. People are treating this like when the Forum of the Twelve Caesars opened in New York City! This perhaps even eclipses the Yankees’ Legends Suite for amount of national media attention given to a ballpark space seen by so few. Great shot of the lavish American Airlines 1914 Club. Image courtesy of the Chicago Tribune. The swank club has two levels. The American Airlines 1914 Club also includes private bunker suites within the exclusive club, a first for the industry in decades. Image courtesy of Chicago Tribune. 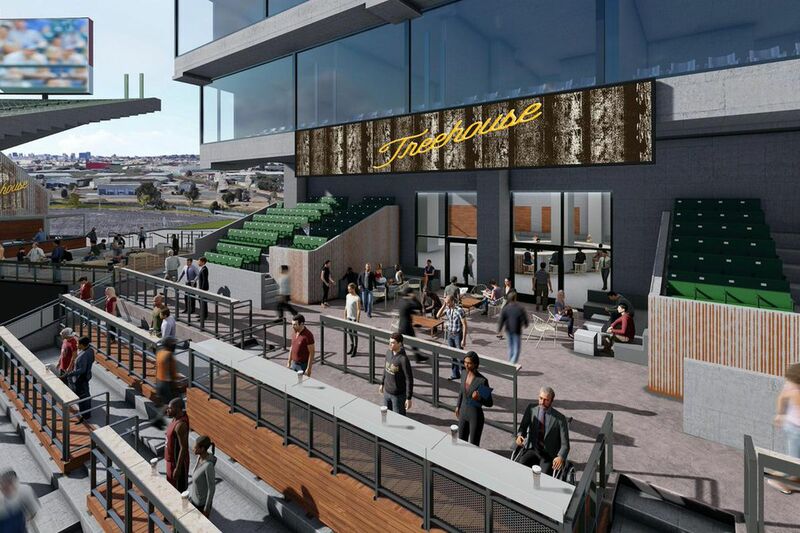 In addition to improving some of the best grub in baseball, the focal point of AT&T Park’s enhancements for 2018 are the historical references. 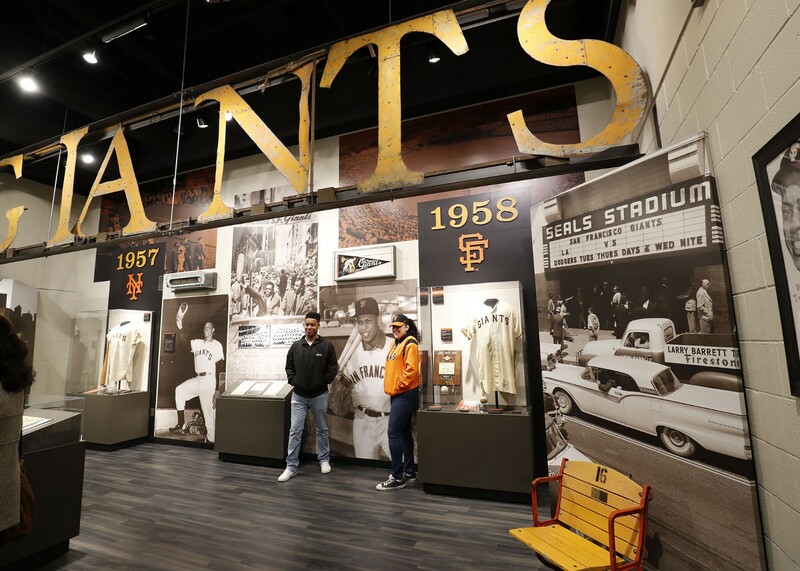 For the team’s 60th anniversary in San Francisco, the Giants have a number of promotions planned, highlighted by a special exhibit called The Giants Vault. Located outside of the O’Doul Gate, the area will feature memorabilia honoring the team’s history. The Giants Vault. I don’t know why, but there is some indication that this display is not permanent, and will just be in existence for the 60th anniversary. Why is this the case? The Giants Vault would be a welcome addition to a great ballpark, one that is already one of the consensus top-2 ballparks in baseball. Image courtesy of Splash Hits. If this is permanent, the Giants Vault will certainly lead to a slight increase in ratings. While the Giants actually do a pretty respectable job in referencing team history throughout the concourses, the park lacks any dedicated historical areas commonly seen most other ballparks. This is likely due the spatial constraints inherent at AT&T, not any oversight by the team, but let’s hope the Giants Vault is here to stay. I haven’t written my full, in-depth review of Citi Field yet based on my trips there (probably because it’s difficult to develop an overarching narrative for a park that never had one of its own in the first place), but the low rating/ranking is mostly a function of my subjective dislike of the now blasé, tired red brick architecture and the horribly cluttered, contrived, and enclosed interior aesthetics. Citi’s poor setting, particularly the absolute worst local scene in baseball, doesn’t help either. Setting (location/local scene), architecture, and aesthetics simply take up too much of my analysis for the Mets’ home to be a top-tier ballpark. That being said, we also get into the weeds and consider more objective factors compared to other ballpark reviews, and Citi Field has always had excellent amenities, and they took another major step forward in that department in 2018. In the premium seating department, Citi Field always stood out by its sheer quantity of club spaces, even comparing well to extravagant Yankee Stadium. However, it was always lacking an ultra-exclusive club behind home plate that was all-inclusive, a fairly standard feature in major league ballparks. Mets fans sitting behind home plate would shell out $200-$750 for the Delta Sky360 Club seats, but almost nothing was included in the ticket price regardless of price point. This premium area was divided into two areas: the primary Delta Sky360 Club and the Delta Sky360 Lounge, accessible to those sitting in the first eight rows. Nothing was included in the ticket price in the former, while snacks (read: popcorn) were included in the latter. The main problem was the lounge was really a laughably cramped room, to the point where lounge ticket holders would just hike up to the main club anyway. I would have advised the Mets to expand the lounge and sell the first eight rows as a separate ultra-premium all-inclusive concept, distinct from the Delta Sky360 Club. The Mets did just that for the 2018 season by creating the First Data Club. Still open exclusively to the first eight rows behind home plate, the renovation doubled the lounge’s size and expanded the list of perks, as all food and non-alcoholic beverages are included in the ticket price. In fact, food is apparently free at concessions throughout the ballpark if you hold this ticket. It still doesn’t equal a true ultra-exclusive club like the Legends Suite, but this is a welcome premium addition to Citi Field. By the way, no change in ratings here, because premium seating was already a 5/5 at Citi. If anyone needs a reminder as to why I analyze this, click here. We would not have our beautiful baseball cathedrals if it were not for the economic demand for luxury suites and premium seating. The second major addition to Citi Field concerns something that many more fans can enjoy: a brewery! The primary flaw of Citi Field’s amenities is that they didn’t have many restaurants, bars, and social spaces that all fans could access, as even the upper deck club has restrictions. The new Mikkeller brewery is part of a larger trend of craft beer at Major League Baseball stadiums. The 10,000 square-foot brewery, taproom, and dining area is located in a formerly dormant area between the bullpen and the right-field gates. The brewery will have 60 beers on tap, and you don’t need a ticket to visit this space. It will also be open on non-game days. This will lead to an increase in rating for the accessible restaurants, bars, etc. category, but the Mets still need to add more social spaces available to all fans. Bar at the new brewery at Citi Field. In a park with amenities defined by clubs designated for certain ticket holders, this is a welcome addition for all fans. More outdoor social spaces, in the vein of those discussed above in St. Louis and Oakland, are still needed at Citi Field. Image courtesy of NY Eater. Opening to fairly positive reviews in 2017, SunTrust Park made only minor tweaks to its ballpark presentation in 2018. The primary change comes to the Delta Sky360 Club (yes, Delta has made quite a dent in premium clubs across sports! ), something that was fairly predictable because it seemed like the Braves overextended their market a bit. This is the secondary ultra-premium home plate club comprising most of the seating behind home plate, with only the more exclusive SunTrust Club occupying the first four rows behind home plate. The space suffered from two main issues: 1) it was frequently crowded, and 2) there was an excess of unsold seating capacity at the back of the club adjacent to the Champion Suites. The Braves responded by adding 2,000 square feet to the club to address the first issue. To address the second issue, the Braves removed seats from the top six rows in two of the sections, and installed terrace tables with swivel chairs in their place. This made perfect sense, as these seats were not selling and the similar terrace tables in the mezzanine Infiniti Club sold out quickly, with Braves management once saying they wished they had doubled or even tripled the inventory of terrace tables. Naturally, the new terrace tables occupying the formerly unsold seats in the Delta Sky360 Club sold out. For 2018, the Reds have made some minor changes to their bar spaces and group areas. In the right field corner, the Budweiser BOWTIE Bar has been expanded. Most notably, the Reds have added 12 private loge boxes above the bar. The boxes feature in-seat service, a private table, and a television. This is an odd location for such private loges, but Great American Ballpark has previously been on the forefront of introducing this premium opinion (common in the NBA and the NHL) to Major League Baseball. The Reds also added a “Garden Bar” by the main entrance, which I hope didn’t replace the UDF Market, a highlight in GABP’s otherwise subpar concession variety. Honoring the Diamondbacks 20th anniversary, Chase Field added a 2,000 square-foot exhibit featuring numerous references to team history, such as information regarding the 2001 World Series Championship and player awards. Chase Field lacks many references to team or baseball history, so let’s hope this is permanent. Chase Field also made a minor enhancement by adding cabanas to the Coors Light Strike Zone. 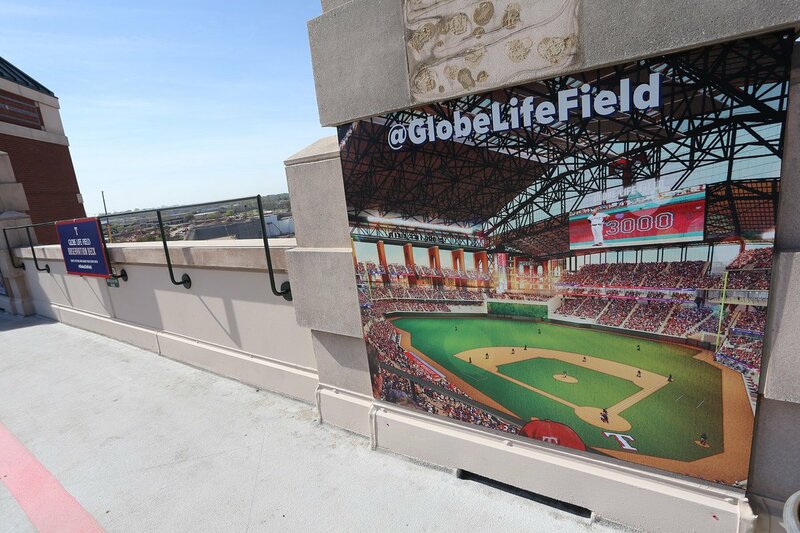 With Globe Life Field opening in 2020, the Rangers obviously aren’t undertaking any substantive capital investments here, but they did add an observation deck on the upper deck right field concourse to view the ongoing progress at Globe Life Field. Observation deck at Globe Life Park, where Rangers fans can watch the construction of Texas Life! and the arguably necessary but far less aesthetically attractive Globe Life Field. Image Courtesy of Texas Rangers. Only one minor change at Comerica Park for 2018: a “Rooftop Deck” group area has replaced bleacher seating on top of the Miller Lite Pitcher’s Pub in right field. The Chevrolet Pavilion will now also be used for groups, which is okay because Comerica already excels in accessible restaurants, bars, sitting areas, and social spaces. The Red Sox added some notable group options for 2018. Similar to the dugout suite in Kauffman Stadium, the Jim Beam Dugout is a field level premium space that replicates the appearance of an actual dugout. Other group spaces and bars, such as the Coca-Cola Corner, Sam Deck, and Sammy’s on Third, have been enhanced in some fashion. Super cool Jim Beam Dugout at Fenway Park. Image courtesy of Boston Magazine. The White Sox are making another addition to their solid array of social spaces for 2018. Located in an area formerly occupied by suites and group areas in the left field corner above section 157, a new taproom will feature Revolution beers on tap. Supplementing the Craft Kave behind the right field bullpens, the White Sox have some of the best quality and selection of beers in any major league ballpark. The Orioles have expanded their Kids’ Corner for 2018. The space retains the signature elements—such as the large-sized bobbleheads—but added a new interactive treehouse activity center and jungle gym called The Bird House. This is part of an overall initiative to better cater to kids and families, highlighted by their much-discussed Kids Cheer Free ticket offering. In commemorating Kirk Gibson’s historic walk-off home run during game 1 of the 1988 World Series, the Dodgers are marking the seat where the ball landed. Section 302, Row D, Seat 1 in the Right Field Pavilion is painted blue and has Gibson’s signature. The first four make sense because of the extensive enhancements completed before the 2017 season. While it still doesn’t possess the amenities of the best parks (as I wrote in a recent Facebook post), Minute Maid Park underwent its most dramatic renovation in 2017 yet by removing Tal’s Hill in center field and adding three social spaces and a few new eateries in center field. Yankee Stadium also went through its largest series of renovations in 2017 by adding numerous social spaces and a new kids’ area. A park noted for its exclusion finally added fan-friendly amenities for all to enjoy. Miller Park still needs to undertake serious capital investments, but it also underwent significant renovations to its concourses and concession spaces in 2017. Other than perhaps Coors Field, Progressive Field has received the best renovations of any park in the 2010s, with almost everything once again state-of-the-art (only the Club Lounge is left on the to-do-list). Seemingly random to the laymen, there’s a reason Progressive Field was awarded the 2019 All Star Game and not parks with a longer All-Star Game drought (like the more highly-acclaimed Camden Yards)! Kauffman Stadium was completely renovated in 2009, and has received appropriate enhancements throughout the 2010s. As I wrote based on my visit, PNC Park could stand to improve its amenities, but even it has made some nice improvements in the early to mid 2010s. Rogers Centre is a different animal. Marlins Park opened in 2012, and should be making some minor improvements in the next five years. Safeco Field is the one park where you hear a lot of talk about substantive changes coming in the next five years. The Mariners upgraded the bullpen market by adding “The Pen” in 2011 and Edgar’s Cantina in 2013. Like nearly every ballpark, a new videoboard was added. However, there have been some rumblings about Safeco Field aging, as its lifespan is right at the point where substantive capital investments are in order. What people in the industry might be missing is that Safeco Field had some of the best ballpark amenities on the planet when it open, and was close to an industry leader for over a decade. Upon opening in 1999 at over $500 million (more than double its cousin in Houston), no expense was spared, in what was a pretty ornate facility at the time. Even today, I think Safeco Field still has some of the best amenities in baseball. Despite my dislike of the ballpark’s architecture and interior aesthetics, this park started head and shoulders above many others. While I’m not addressing changes in regular concessions, which happen every year everywhere, and there is a thin line between a minor alteration and something too minor to mention, let me know (via Facebook, preferably, but you can also e-mail me at cole@ballparkratings.com) if you see any significant oversights I missed at your home park! Hat hip to the Chicago Tribune. Without its 2016 analysis on videoboard size (before sources differed fairly widely), this would be difficult. I have been taking its authority.